There are a few details that Karbon exposes to make this decision easier for you. If more than one team member is included in one email, you might be unsure whether or not should action it. To ensure you are not going to duplicate work or tasks that have already been created, you will see when an email has been tagged to work, has already been replied to, or if the email has been assigned. Open the email and get a view of what has already been done. If you are satisfied that the email has been actioned already, you can clear it from your Triage. 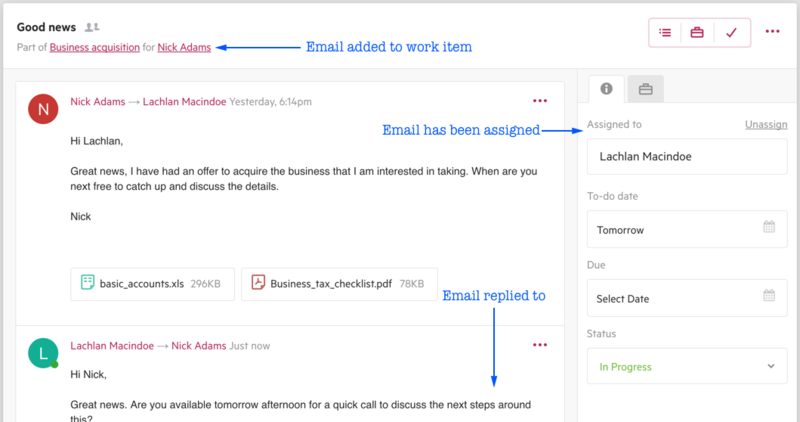 If the email has not been assigned and a task is required, assign it to yourself or someone on your team. Do yourself or your teammate a favor by adding a due date—even if this is a rough date—as this can help with prioritizing items on to-do lists. Click add to work and search by organization name and a keyword of the work type (i.e. payroll, bookkeeping, etc.). This will help narrow your list of work to choose from. If you find the work, click on it to tag it. Now that email will be listed on the timeline for that work. If you don’t find the appropriate work item, click on Create work. If the email is important and needs to be stored on the client timeline, simply add to contact and search for the client name.